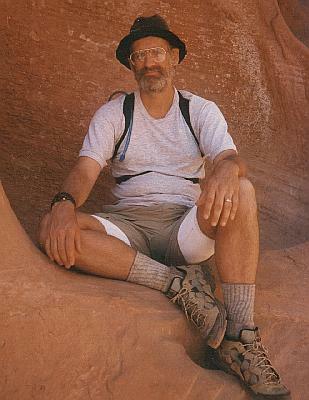 My Uncle Jim has been climbing, paddling, skiing, and exploring the Utah and Arizona desert with a group of friends for many years. Attendance varies, depending on who is free, and who is interested. This year he invited my son Ben, and I then invited myself. As it turned out, Ben could not go, but I was still interested. 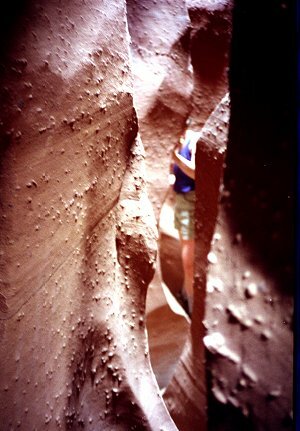 This particular trip was inspired by a video Jim checked out of the library, which discussed how to photograph the deep, narrow "slot" canyons of southern Utah. 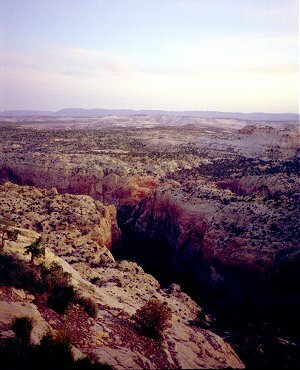 Jim planned the trip to visit the canyons shown in that video. Jim has been a mysterious figure all my life. We had met a few times over the years; only once for any extended period of time, over thirty years ago. I was often compared to my uncle -- tall, quiet, left-handed, interested in the outdoors. Some of the attraction of this trip for me undoubtedly had to do with getting to know this mysterious figure a little better. nothing can compare with really being there. Sandy sent me some of the pictures she took, which are much better. The ones she took are identified in the alternate text -- but it is pretty obvious which ones they are. After concluding a business trip in Denver on Friday, and hiking in Rocky Mountain National Park on Saturday with a friend from work, I drove to Fort Collins to meet me uncle. We spent a very pleasant afternoon getting to know each other, running errands, buying food, etc. With a full day's drive ahead of us, we were up before dawn. I met Dave, Jim's lifelong buddy. Then on to Glenn's to rendezvous with most of the rest of the group. There I met Glenn, Bill, Sandy, Pat, Deb, and LuAnn. We packed up the cars and headed off towards Dillon, where we picked the last member of the group, Cindy. We proceeded on to Grand Junction. It was old hat for most of the group, just zooming through the Rockies on the Interstate, but I have not been through there for many years. Most of the peaks above the road were still clad in snow, shining brilliantly in the bright sunlight. Everything was green and pretty. The interstate's descent through the steep, narrow Glenwood Canyon was impressive. The water level was high and scary-looking. After leaving the canyon, we began to enter the desert. Off to the right were high cliffs, striped black and white. We passed beneath them for miles. I was told that these were the "Book Cliffs" and that the black bands were oil shale, that had been mined a bit during the oil crisis of the 70s. I enjoyed the sunny, warming weather as I got to know some of my traveling companions better. Because I was enjoying the scenery so much, my car (and one other) agreed to take the scenic route to Escalante, through Capitol Reed National Park, while the others traveled farther on the interstate. As we were driving through the park, we found the traffic stopped amid a large cloud of dust. 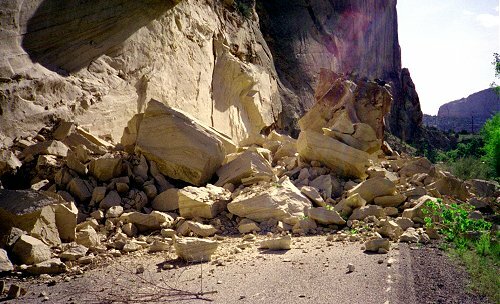 Then we saw that the cliff above had collapsed onto the road ahead. The driver in front of us had seen it fall. The rock was exceedingly soft -- I picked up a chunk the size of a baseball and crushed it to sand in my hand. The largest piece, visible in the picture, was about the size of a car and had fallen perhaps fifty feet. Strangely, the loose rocks on top were still in place. Because there is only one paved road crossing Capitol Reef, we had to take a forty-mile detour via the Burr Trail. I have long wanted to see this road, the subject of much controversy when local interests attempted to have it paved. I just did not have the courage to ask everyone else go through the ordeal. What a stroke of luck ! The drive was spectacular, following a long valley bordered by cliffs climbing skyward on both sides. Then, most impressive, the road turned sharply and ascended via steep switchbacks up the cliff and onto the plateau beyond. Even with this delay, we arrived at dusk, in clear, warm weather. The others, who had waited for us at an earlier rendezvous point, arrived five minutes later. Jim picked the perfect time of year for the trip. The weather was warm and dry, and the flowers were in bloom everywhere. Generally I do not take photographs of flowers, because they so rarely turn out for me, but I just had to make an exception here. 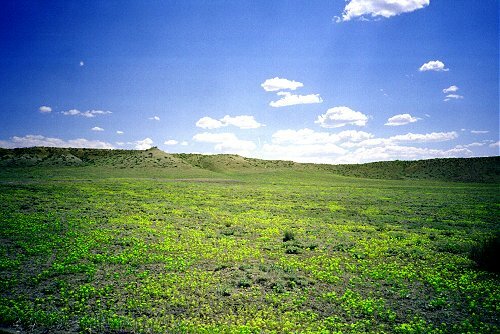 One particular layer of rock, gray and soft, hosted beautiful tiny yellow flowers, and almost no other vegetation. The contrast between the barren gray slopes and the bright yellow flats is only dimly captured in this picture. Our first day's objective was to explore several slot canyons in upper Coyote Gulch, part of the Escalante Canyon watershed. To reach the trailhead, we traveled about 20 miles down a dirt road, along some more cliffs (Straight Cliffs) of alternating white and black bands. I learned that these black bands were coal, and that the area bordered by these cliffs (Kaiparowitz Plateau) had been slated for strip mining before it had been made a National Monument last year. Straight Cliffs rises about 2000 feet, and form an unbroken face almost 50 miles long. At the base of the black and white striped formations is the red layered sandstone known as Navajo Sandstone and Quaint Sandstone. This formation is responsible for the slot canyons, and many of the other notable features of southern Utah. I don't understand how these canyons came to be formed, but they were always in this sandstone layer. It is remarkable both because of its red color, but also because it preserves frozen sand dunes. Everywhere the canyons cut through the walls, the remains of these ancient sand dunes are clearly visible. 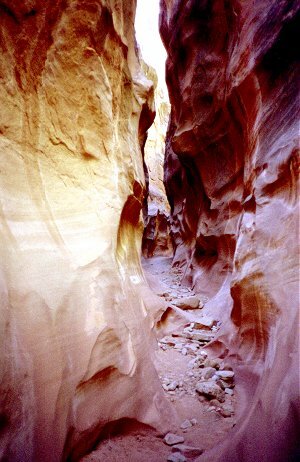 The slot canyons themselves, narrow, deep, and with nearly vertical walls, were formed by the action of flowing water. How much water, and at what speed, I could only speculate. All were bone-dry during our visit. 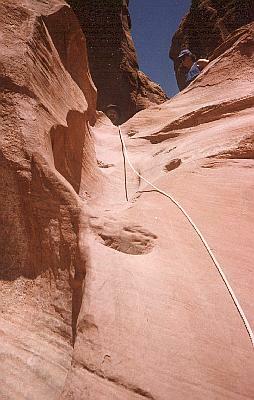 We started out by entering Coyote Gulch, and then exploring up several side canyons. Hiking in these canyons was generally pleasant. The floor was generally pretty flat, shaded and cool. Occasionally there were steep places, waterfalls when water is present, or places where obstructions that had fallen into the canyon and gotten wedged in place. 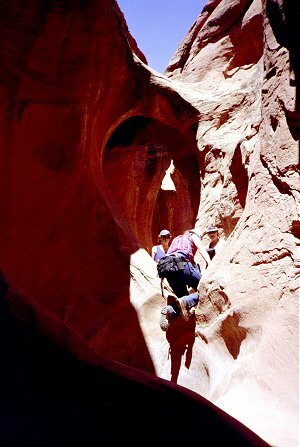 Here we are going up a little bowl formed by swirling waters, getting ready to duck through a hole in the rocked formed by the canyon. Here I wedged myself between the walls and scooted up a ways to photograph the rest of the party passing beneath me. The canyons went on and on, twisting and turning. Each time it seemed to be ending, or coming closer to the surface above, a new vista would open, and the land above would rise, deepening the channel again. 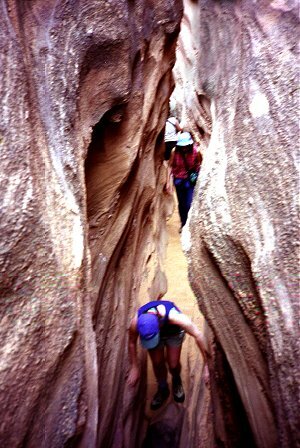 A few times the canyon became so narrow that we had to take off our daypacks to squeeze through, or to crawl over or under obstructions. In one spot, I could only fit through the canyon if I exhaled. Some of the rest of the party could not make it past that point at all. 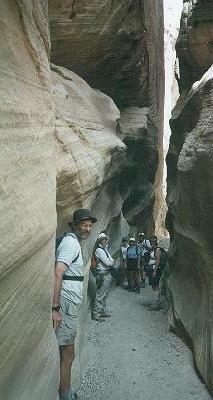 Passing through different layers of the red sandstone, we would see different formations. This layer, near the upper end of all the slot canyons we explored in Coyote Gulch, contained purple pebbles embedded in softer red sandstone. I was curious to see the extreme upper ends of the canyons. 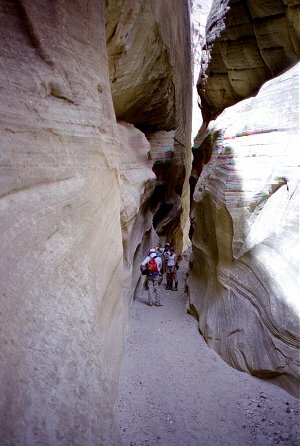 As it gets closer to the end, the slot canyons are open to the sunlight, and can be entered relatively easily. 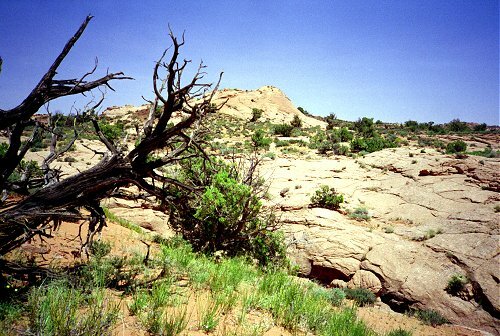 The canyon floor is usually scrubbed clean of sand, rocks, and debris. The gradient does not seem to steepen perceptibly though. It is almost as though the slope of the canyon floor is indifferent to the height of the walls surrounding it -- as though it has had plenty of time to carve its own level in the red sandstone. At the very top, there is a typical dry wash; perhaps 20 feet wide meandering gently over the flat plateau above. 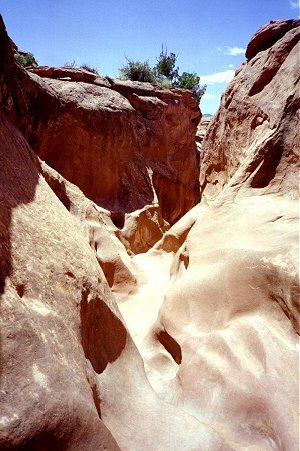 As this wash enters the sandstone it suddenly narrows, cutting through the solid rock, until it emerges a half mile or a mile distant, and a hundred feet lower. It was sobering to imagine the water, perhaps 20 feet wide and a foot deep, funneling into a canyon only a couple feet wide (and ten feet deep ?). I climbed up to the plateau beside one of the canyons, to see if I could spot it mid-course. The grass and shrubs in the foreground is the side, and the rock behind is on the opposite side. 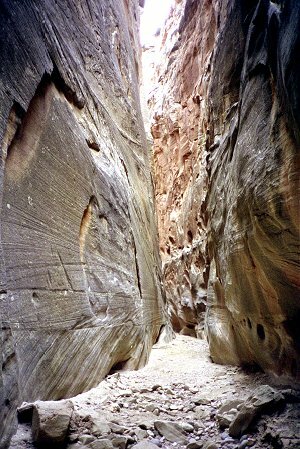 The canyon, about 30 feet deep here, is narrow enough to step across. If I did not know it was here, I would not be able to find it. At the end of the day, we returned to camp off the road, under the Straight Cliffs near Escalante. Each day, the rest of the party looked up at the sky and decided to set up their tents in case it rained. I took my chances, and slept under the stars. Actually the moon was so bright that I could not see many stars. I was tired enough that I fell asleep immediately every night, and did not really spend much time looking at the sky after sunset. Our next destination was Kodachrome Basin, a short drive across the Kaiparowitz Plateau to the next major watershed. On the way, we visited Escalante, had a cold soda, and checked out the joint Forest Service/BLM office for ideas. (Cindy is a Forest Service District Ranger in Colorado; Jim and Dave are retired from the Forest Service.) The office in Escalante apparently met with their approval. I appreciated a big book of topo maps, marked with handwritten notes about canyons and other places of interest. We stopped at Kodachrome Basin State Park to claim a camping spot, while there were still some left. This would be our day of luxury -- a campground with bathrooms and showers. The area, again set in the red sandstone, has many rock spires and arches. The spires were formed when springs and geysers carved through the sandstone, forming holes. Later these filled with harder sediment and solidified. This harder sediment stands today, after the softer rock around it has eroded. Many of the towers have been given fanciful names, such as Fred Flintstone, the Ballerina, the Geyser. Strangely, this tower, one of the highest and most impressive, is unnamed on all the park maps. The red sandstone that makes Kodachrome Basin so photogenic is overlain by lighter rock (limestone ? 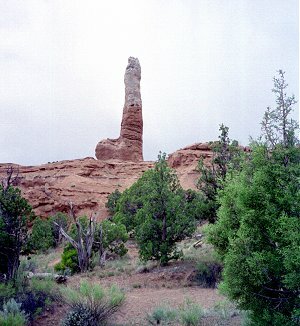 ), which can be seen at the top of many of the spires, and in the cliffs surrounding the park, seen in the background of this picture. 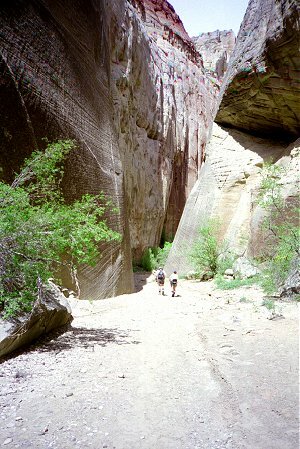 After getting camp set up, we headed for Round Valley Draw, another slot canyon nearby. Round Valley Draw is much deeper than the canyons of Coyote Gulch. The trail enters from the side, down a very steep scramble over loose rock. The rock here is white rather than red, and appears much harder. It is hard to capture the scale of the walls of this canyon in a picture, because they would not fit within the camera frame. Here we are entering the narrows, from the relatively wide section near where we entered. Quickly, the walls close in tighter and tighter. We followed the canyon for an hour or so, as it narrowed and widened just a little, then narrowed again. From time to time we passed through sections where the frozen sand dunes were unmistakable. On the left, the layers of sand were deposited on a slope, then eroded flat, then more sand was deposited more-or-less flat. It looked exactly like the diagrams in textbooks. Two circumstances cut short our exploration of Round Valley Draw. First, we reached a portion of the valley floor blocked by a huge stone, which had fallen in from above. We were in the process of figuring out how to climb over this stone, when the occasional sounds of thunder became louder and closer, and it started to rain. We could hardly see the sky to judge the magnitude of the storm, but we did not want to be caught in the valley floor during a flood. The walls seemed to magnify the sounds of the thunder (or maybe it was just incredibly loud), and the water started to pour out of the sky. What had taken us an hour to enter took only half that to exit. Despite the steep walls, a surprisingly great amount of precipitation made it to the bottom, drenching us all. Luckily, the rain tapered off as we neared the entry/exit point of the canyon, and we headed up the side in light showers. Near the top, the rain resumed, but we were safely away. There had not been enough rain to create more than a few puddles of water on the canyon floor. Back at Kodachrome, we dried out and cleaned up. Again I gambled on a clear night while everyone else got into tents. By sunset, not a cloud was to be seen. We spent a leisurely morning exploring the area near Kodachrome Basin. 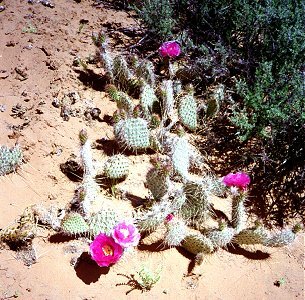 The cactus was in bloom. Its purple flowers really stood out in the desert. 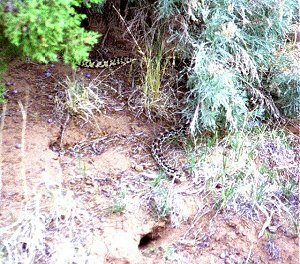 We saw a number of snakes of various types on the trip. 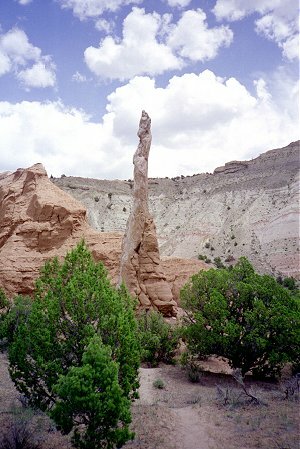 This one made its home in Kodachrome Basin. 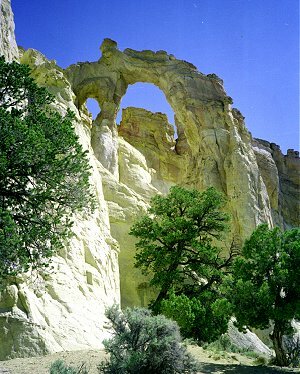 This formation, Shakespeare Arch, is a short distance from the campground. Actually, the stone spires are more impressive, but somehow the arches get the most publicity. 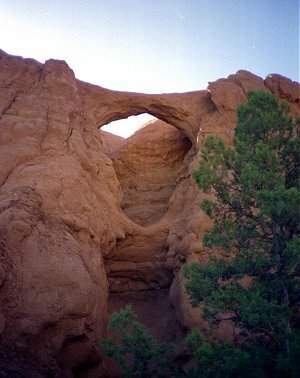 This rare double arch (Grosvenor Arch) is a few miles down the road from Kodachrome Basin. It was named after the publisher of the National Geographic, who was instrumental in setting aside Kodachrome Basin as a public park. The trees in the foreground give a false sense of perspective. The arch is actually much larger than this picture makes it seem. We proceeded down the road, towards Lake Powell, visiting additional slot canyons on the way. The cliffs surrounding the road rose and fell as we passed through red, white, gray, and pink bets of stone. All this time, we saw only occasional cars on the dirt road. Finally we reached Lake Powell. The sight of the cool, blue lake, in contrast to the bare rock of the past several days was breathtaking. We drove down the the beach, where we saw a lineup of RVs along the shore and watched as several 4WD vehicles competed to see who could race up the steep slopes fastest. The car following us, driven by German tourists, got stuck in the deep sand. We got out to push them out, then fled ourselves. 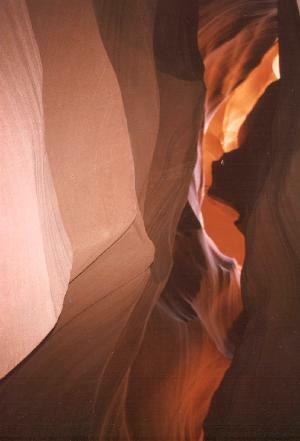 The day's objective was to visit Antelope Canyon, one of the most beautiful of all slot canyons. 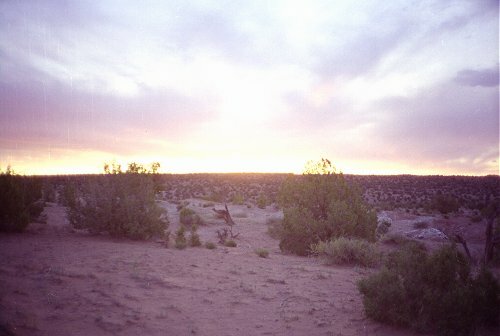 It is on Navajo land, and we needed their permission to enter it. After some confusion about the correct time (Utah is on daylight savings, but Arizona is not, but the Navajos are ??) we got to the canyon. What makes this canyon unusual is its deep red color (richer than most of the others) and the complex sculpted shapes of the canyon. The canyon is so narrow and twisty that there is no clear view of the sky from most parts inside. What light there is reflects off the red walls in complex patterns, enhancing the sense of strangeness. It is cold and dark inside, almost like a cave. Handheld photos were out of the question -- my camera wanted a two-second exposure even at the widest aperture. The only pictures that turned out were taken at the entrance, or had spots of direct sunlight in them, washing out everything else. This is the only one that captured even a fraction of the experience. 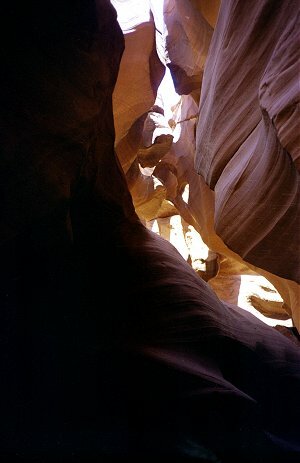 This photo, taken looking straight up at the sky, illustrates how complex Antelope Canyon is in the vertical as well as the horizontal dimension. A number of photographers had equipment set up in the canyon, waiting for the right moment to get the desired effect. The canyon was not long, no more than 15 minutes stroll from one end to the other, but I could not help going back time after time, trying to take in the unique feeling of the place. 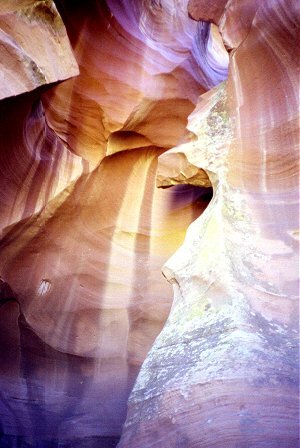 Another photo, this one one by Sandy, looking up at the sky from within Antelope Canyon. After leaving Antelope Canyon, we headed towards home. We spent the night at a very pleasant Forest Service campground in Utah, after having dinner in a small cafe south of Moab. Again we noticed the German tourists. Sometimes it seems that half the visitors to the Utah desert are Germans. I have noticed this, to a lesser extent, in other national parks. I wonder whit it is. I tend to think of these areas as second-tier attractions, not that they would be less interesting to visit, but simply that they would be less well known. Oh well, what do I know ? Returning from Utah we drove through Monument Valley, which just went on and on. Each huge red wall seemed more impressive than the last. I kept wanting to jump out and photograph each one. In the end, none of the pictures does them justice. I returned in a different car, getting to know some of the rest of the group better. It is a really nice group of people. Each one seems to know what to do, without having to be told. 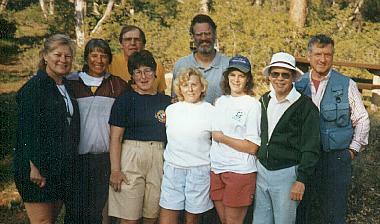 The group had an unhurried pace, in which things got done but no one felt harassed or that we were missing something. The last part of the way, I got to travel alone with my Uncle Jim, having time to talk and listen, getting to know him better than I have ever have. This was perhaps the greatest highlight of the trip, probably the one I will remember the best.